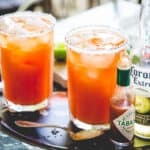 Here’s how to make killer micheladas, also known as red beer. It’s a savory beer drink, served with ice, lime, hot sauce and tomato juice. They are super refreshing on a hot summer evening. Run lime half on rims of glasses to moisten. Place salt on a plate. Dip rims into salt, and shake off any extra. Squeeze one whole lime into each glass. Add 4 dashes Worcestershire to each glass. Add Tabasco to each glass. Add Clamato juice, dividing evenly. Top with ice. Fill to the top with beer. Stir to mix. Serve with the remaining beer on the side.